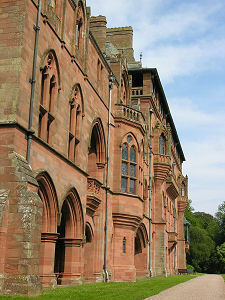 Mount Stuart is an incredible Gothic palace in red stone. Created by the 3rd Marquess of Bute from the ashes of an earlier house on the site, it was was begun in 1879 and remained "work in progress" on his untimely death in 1900. The 3rd Marquess has been described as a compulsive builder, responsible for buildings as varied as Cardiff Castle and the restored Falkland Palace, and it is tempting to suspect he saw Mount Stuart as a hobby almost as much as he saw it as a family home. Today's Mount Stuart is the foremost visitor attraction on the Isle of Bute. The house is surrounded by a 300 acre estate of gardens and woodland and visitors can enjoy a range of landscapes, as well as the house itself. And the new visitor centre demonstrates that Mount Stuart's role in staying at the cutting edge of architecture is alive and well. 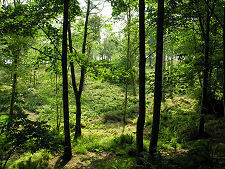 The story of Mount Stuart is the story of the Crichton-Stuart family. They can trace their origins back to (and beyond) Alan, the hereditary Steward of William I. He was granted the Isle of Bute in about 1200 by William, and he subsequently built Rothesay Castle in an effort to hold the island against the territorial ambitions of the Norse. The family continued to live in Rothesay Castle until its final demise in May 1685. They then moved into the Old Mansion House, which still stands in the High Street in Rothesay. This was probably only ever intended to be a stopgap solution, until a home could be found offering something more befitting the status and needs of one of the most important families in Scotland. It was the 2nd Earl of Bute who, in 1716, had plans drawn up for a grand house looking over the Firth of Clyde towards Ayrshire from a raised coastal site a little over three miles south of Bute. 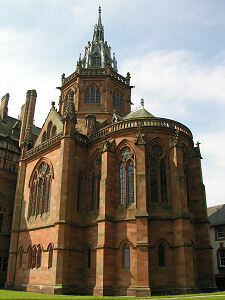 In 1719 the first Mount Stuart was completed. If you assume that the 2nd Earl had his pick of sites on Bute, it's not immediately obvious why he would have selected the site that became Mount Stuart. On gently sloping land above a raised beach, the position was not really high enough to afford the best views available from Bute. And neither is the coastline here especially attractive. 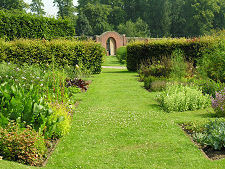 The only conclusion is that although views across to Ayrshire were a consideration, it was much more important to have a large area of land that could be developed into gardens and policies around the house: and perhaps proximity to Rothesay. was also a factor. The first Mount Stuart was pretty grand by most standards, though not by those of the house that eventually took its place. Viewed from the west front the main house was seven bays wide (by five deep), and comprised two storeys and a partly exposed basement. 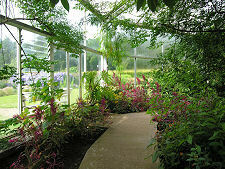 Because of the sloping site the garden front, looking east towards the Firth of Clyde, had three storeys. Back on the west front, two storey high Palladian wings extended to the side and forward of the main house. 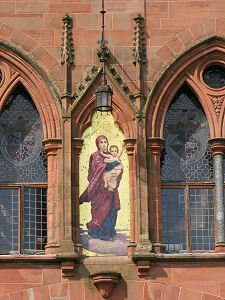 Mount Stuart was undoubtedly out of date by the standards of the day when the 3rd Marquess of Bute, who had been born here in 1847, commissioned a major restructuring of the house in 1873. 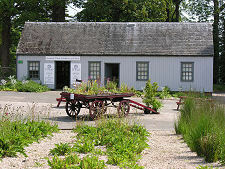 But on 3 December 1877 the main part of the house caught fire. Fire fighting equipment proved to be useless and it was only with the help of many volunteers from Rothesay and the crew of HMS Jackal, who landed on Bute to help fight the fire, that the wings of the building were saved, together with most of the furniture, paintings and valuables from the main house. 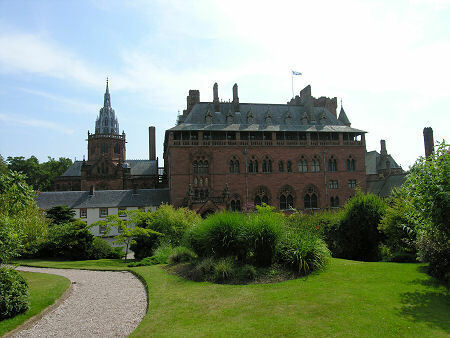 Within two months the 3rd Marquess of Bute had commissioned the celebrated Scottish architect Robert Rowand Anderson to produce a new Mount Stuart. The building that emerged over the following 21 years until the death of the 3rd Marquess was remarkable. It was far more imposing that its predecessor, living up to his desire for a palace rather than a house. The west front, facing the slope containing the rock garden, shows the way the new house incorporated the earlier wings, relegating them almost to the appearance of service quarters. This effect was accentuated by the fact that the original wings retained their white harling, while the new house was constructed entirely from red stone. 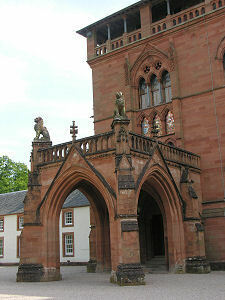 In many ways, the real effect of the new Mount Stuart is best appreciated from its east front. Here the mighty main block of four storeys plus attic dominates a building which, though highly asymmetrical, was very clearly designed to look and feel in harmony with itself. The main block is topped off with an eaves gallery, a walkway that runs around all four sides of the house at roof level. Photographs of the house during construction suggest that the outward extension of the roof to cover the gallery may have been an afterthought: but probably a necessary one for the gallery to have been much use in the Scottish climate. 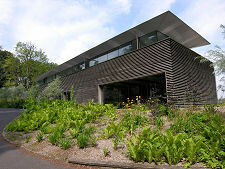 What the gallery does do, however, is give the house a slightly watchful appearance. 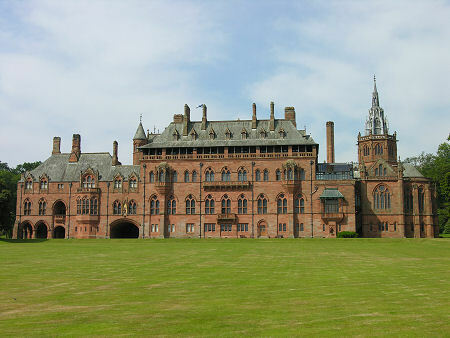 Internally, Mount Stuart was built around a vast central hall, sixty feet square and three storeys high. 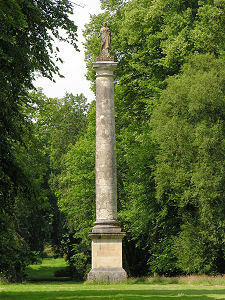 It is said that the marble pillars which surround the hall saved £20,000 over the alternative of granite pillars: but throughout the building there is very little sign of corners being cut and it is simply impossible to estimate how much the house cost to build. What is clear is that it lacked for very little. Mount Stuart was home to the world's first domestic heated indoor swimming pool; and was the first house in Scotland to be lit by electricity. 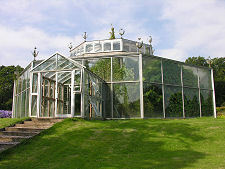 The Crichton-Stuart family lived in Mount Stuart until 1993, with work to complete some elements of the original plans for the house still taking place as late as the 1980s. In 1989 the house was transferred to the Mount Stuart Trust, whose role was to preserve it for public benefit, and although it is no longer a family home, Mount Stuart retains much that reflects the vision of the 3rd Marquess of Bute and those who have succeeded him. Isle of Bute, PA20 9LR.